Soi • rée - noun. An evening party or social gathering. Soirée Entertainment was founded in 2009 by Emily Dunkin. The goal of Soirée is to fuse multiple styles of dance and entertainment including ballroom, ballet, jazz, magic, singing and acting. This group of extraordinary professional performers have diverse backgrounds in many unique forms of entertainment. Soirée has performed at different venues and events around Albuquerque and continues to collaborate, expand, and grow. Would you like to hire us for your party or event? We can add spice, elegance or fun to any party, gathering or event with one of our unique shows. We can perform at any type of venue from private events to large community festivals. 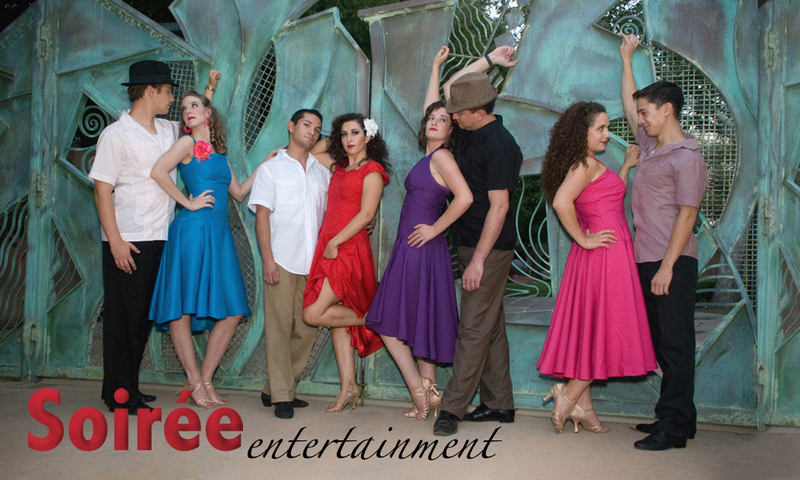 A few of our specialty shows include Latin Dance, Ballroom, Swing and Musical Theater! Want a show with a specific genre or theme? Contact us and we can create a show for you. The possibilities are endless!